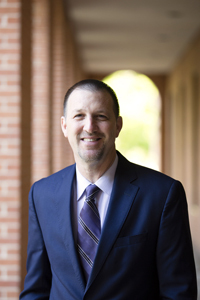 Baylor>Department of Religion>Our Faculty>Faculty>Derek Dodson, Ph.D.
Derek Dodson began teaching at Baylor University in 2007 after receiving his Ph.D. from Baylor in 2006. He is a native of Demopolis, Alabama, and has served on church staffs, including as pastor, in Alabama, Kentucky, and Texas. Dr. Dodson feels that academics and ministry provide a kind of "warp and woof" to his life: teaching Religion at a Christian university, interacting with students about issues of faith, researching in the area of New Testament studies and early Christian literature, teaching Sunday School at Seventh & James Baptist Church, and guest preaching when the opportunity arises. He and his wife Sherrie have two daughters, Kelsey and Emily. The Gospels and Acts, as well as other early Christian narratives; the Gospel of Matthew; the literary and rhetorical function of dreams and visions in ancient literature; the hermeneutical task of appropriating the Christian scriptures for theological and ethical reflection. Engaging the Christian Scriptures: An Introduction to the Bible. Baker Academics, 2014. Co-authored with Andrew E. Arterbury and W. H. Bellinger, Jr.
Reading Dreams: An Audience-Critical Approach to the Dreams in the Gospel of Matthew. Library of New Testament Studies 397. London: T&T Clark, 2009. "The Encomiastic Function of the ‘Fulfillment Quotations’ in Matthew 1-2.” Paper presented at Paper presented for the Matthew Section, Annual Meeting of the Society of Biblical Literature, San Diego, California, November, 2016. "Dream Magic: The Dream of Pilate's Wife and the Accusation of Magic in the Acts of Pilate." Paper presented for the Christian Apocrypha Section, Annual Meeting of the Society of Biblical Literature, San Diego, California, November, 2007. "Scripting Dreams: The Gospel of Matthew's Use of a Literary Convention." Paper presented for the Matthew Section, Annual Meeting of the Society of Biblical Literature, San Diego, California, November, 2007. "The Romance of Abraham and Sarah: Novelistic Features in the Apocryphon of Genesis." Paper presented for the Ancient Fiction and Early Christian and Jewish Narrative Group, Annual Meeting of the Society of Biblical Literature, San Antonio, Texas, November, 2004. "Philo's De somniis in the Context of Ancient Dream Theories and Classifications." Perspectives in Religious Studies 30 (2003): 299-312. "Dreams, the Ancient Novels, and the Gospel of Matthew: An Intertextual Study." Perspectives in Religious Studies 29 (2002): 39-52. View Dr. Dodson's CV and Books.